Fish for dinner has never been like a treat to me – until I stayed on a detox diet for over seven days. The detox diet I went on allowed one to add chicken and fish on the eighth day. I added chicken first. A few more days went by before I tried fish, and it was definitely a treat. Vegetables and fruit are good to eat but can become boring without eating any meat. Thinking about why fish is not greatly appealing to me, I came up with the reason. My mother was allergic to fish, and I don’t remember a time that she cooked fish for the rest of the family. She couldn’t stand the smell of it. There is an exception to fish not being a treat. Seafood. I grew up on the Gulf Coast in Southeast Texas, location of some of the best seafood restaurants in the U.S.A. Sitting down to a feast of fried shrimp or shrimp scampi, stuffed crab, gumbo and hush puppies is definitely a treat – one that I have saved for birthday celebrations many times. Unfortunately, the seafood I like is not the kind to add to a detox diet you’ve been on for a week. You would need to start back at the beginning of the diet. But I did find some frozen Mahi Mahi from Target to try. Not bad. In fact, it’s pretty good. So good that Ive already had two dinners with the Mahi Mahi. The first time I served it with wild rice, sauteed mushrooms, sweet potato, and broccoli. The second time I left out the broccoli. I like that it only takes 35 minutes to thaw, and I like the taste (see recipe below). Divide oil on griddle to sautee mushrooms, green onions/spinach on one side of griddle and fish on the other side until fish is done (about 12 minutes, turning once). Add seasonings to vegetables and fish. 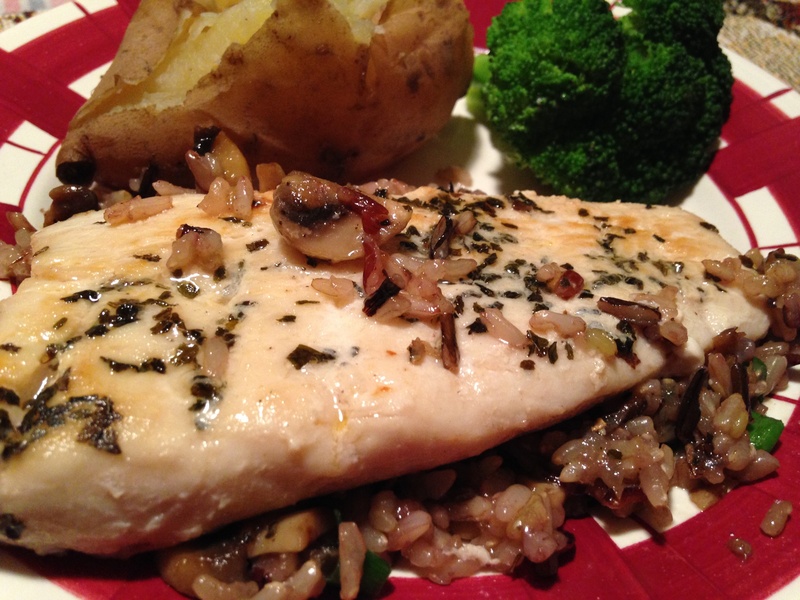 Serve fish on bed of wild rice. I don’t like fish, but I like broccoli. Your food looks pretty. How are you cooking your would rice? That should be WILD rice not would rice. Commenting from new phone. Auto correct, Ugh! I cook it in a saucepan for about 40-45 minutes. When I use the wild rice leftovers, I add it to the veggies I’m cooking to heat it up. Works great. That looks very good. Are you allowed to have shell fish or just the scaly type. I really like halibut, salmon, cod, and mahi mahi. Of course, fresh tuna is amazing on the grill. I am acquiring a taste for tilapia, but my recipes would require detox. I found a copycat recipe for olive gardens parmesan crusted tilapia. No shell fish yet, at least I haven’t had any. Salmon is ok. I like cod and tilapia though.